Okay…I think this is a first. An absolute first since I started receiving my Cuisine Cube orders. If you’re just tuning in, Cuisine Cube is a brilliant service that sends a box of 5-6 lesser known company products in the gluten-free world to my door…for me to enjoy…each month. Yes. Each month. And for a really good fee as well. I always look forward to my cube and have been trying to get through the items that have been sent in May-July as my August cube is to arrive tomorrow and I still have quite a few untried and untested products in each box. But…I’m getting there for sure! So…there is my plug for Cuisine Cube. And I encourage anyone in my gluten-free reading circle (or even if you’re not gluten-free!) to give Cuisine Cube a try. You can cancel at any time…but I’m loving it too much to even dream about canceling. Because, it seems, they have nailed these products and sent some of the most amazing products I, otherwise, never have discovered or heard about. And usually…these products wow me and astound me and make me want to seek them out so I can keep them in my pantry. But…this time…for the first time in four months…I didn’t care for a product that was inside. The product in question was in my June Cuisine Cube. It was the Southern Culture Artisan Foods Shortstacks Gluten Free Vanilla Pancake and Waffle Mix. Now…I absolutely love pancakes and waffles. I wouldn’t be a runner if I didn’t. Let’s face it. HA! Seriously, there is nothing quite as satisfying as a delicious soft pancake with hot maple syrup drizzled over it…or a crunchy on the outside, soft on the inside waffle fresh from my waffle (stick) iron. And yet…they are a breakfast item I so rarely make as the waffle maker sometimes drives me nuts and, well, I just haven’t done pancakes in awhile. With my friend, Greg, in town…I figured I could test out the Southern Culture Artisan Foods Shortstacks Gluten Free Vanilla Pancake and Waffle Mix for breakfast on Sunday. I had already hit up the gym and done some laps in the pool (SIGH! ), so after a shower…I grabbed the little container of the Southern Culture Artisan Foods Shortstacks Gluten Free Vanilla Pancake and Waffle Mix and headed into the kitchen. I dug out my waffle stick maker and got it heating up. I sprayed it with cooking spray and then got to making the batter for the waffles. I realized I had no eggs…but thankfully there is a vegan version of the mix on the container. No eggs needed. I emptied the bag of mix into a large bowl and added 1 cup of unsweetened almond milk and 4 tablespoons of vegetable oil. Per the instructions. I gave it a mix…and it was just dry and clumpy and…not batter. So I added more almond milk, and it didn’t do much different…but at least it was a bit creamier. I pulled out my 1/3 cup scoop (that’s the serving size) and poured the batter into the waffle iron. I spread it out with a knife, adding a little batter here and there where needed to fill in holes. Then, I closed the lid and let it steam and cook and get toasted and crispy. It took about 6 or 7 minutes total. I decided to take a chance and serve Greg first. He’s rather particular about his food…so I crossed my fingers, laid it out with some warm maple agave syrup, and went back to start on Cathy’s (the roomie!) waffles. So, this immediately sent me scrambling for the package to see what might be salty in the mix. And, near the end there is salt, but it was one of the last ingredients listed. However, I did note that there were two different bean flours that were used in the mix…and I thought, perhaps, the bean flours were giving it that flavor to her. I would have to wait for my waffles to finish so I could see for myself. I pulled my waffle sticks from the waffle iron, gave them a drizzle of syrup, and settled in to tuck into my breakfast. One bite…and I totally knew it was the bean flours. The flavor of the Southern Culture Artisan Foods Shortstacks Gluten Free Vanilla Pancake and Waffle Mix…is, supposedly, vanilla. I don’t get vanilla at all. I did see what Cathy meant about the “salty” aspect of the prepared waffles. I definitely could pinpoint it as to being a result of using both chickpea and fava bean flours. It sort of reminded me of why I disliked the flavor of some of the Dr. Lucky’s Gluten-Free Cookies, which also uses bean flours as a base…and you can tell. The texture of these waffles were perfection. It got that golden crust on the outside and nice and soft in the middle. A perfect cook indeed. It fluffed up in the waffle iron and was golden perfection. I was really excited about them. Until I took a bite. Because they didn’t have that vanilla flavor that was advertised. They had bean flavor. And I don’t want bean flavored waffles. Seriously. That’s…disgusting. When you bite into a waffle or pancake, you want the buttermilk or vanilla or whatever flavor you expect. This salty, bean flavor was not what I expected…or wanted. I was really turned off and it was a fight to actually get me to finish them off at breakfast. Drown anything with syrup and you can get through it, I guess. So, let’s talk about the ingredients in the Southern Culture Artisan Foods Shortstacks Gluten Free Vanilla Pancake and Waffle Mix. This mix is a blend of an organic gluten-free flour blend (garbanzo bean flour, potato starch, tapioca flour, whole grain sweet white sorghum flour, and fava bean flour), organic sugar, leavening (monocalcium phosphate and sodium bicarbonate, cornstarch), baking soda, salt, vanilla bean powder, and xanthan gum. The mix itself is gluten-free, vegan, dairy-free, and cholesterol free. As for nutrition information, a serving of the Southern Culture Artisan Foods Shortstacks Gluten Free Vanilla Pancake and Waffle Mix is 1/3 cup. There are 4 servings per container. One serving will provide you with 170 calories and 0 grams of fat. This serving will give you 590 calories and 3 grams of sugar. And finally, you will be taking in 1 gram of fiber and 5 grams of protein. All-in-all…I was just really disappointed with the Southern Culture Artisan Foods Shortstacks Gluten Free Vanilla Pancake and Waffle Mix. I had gone into it with an open mind and a lot of confidence because it was from Cuisine Cube…and I’ve never disliked something (until now) that was in my Cuisine Cube. This just was strange…the flavor was way off. I wish it had been delicious because I liked everything else about the waffles. Just not the taste. Well, we can’t win them all. I can’t wait to move forward and try something else from my next cube. But I don’t think I’ll be ordering any more of the Southern Culture Artisan Foods Shortstacks Gluten Free Vanilla Pancake and Waffle Mix. 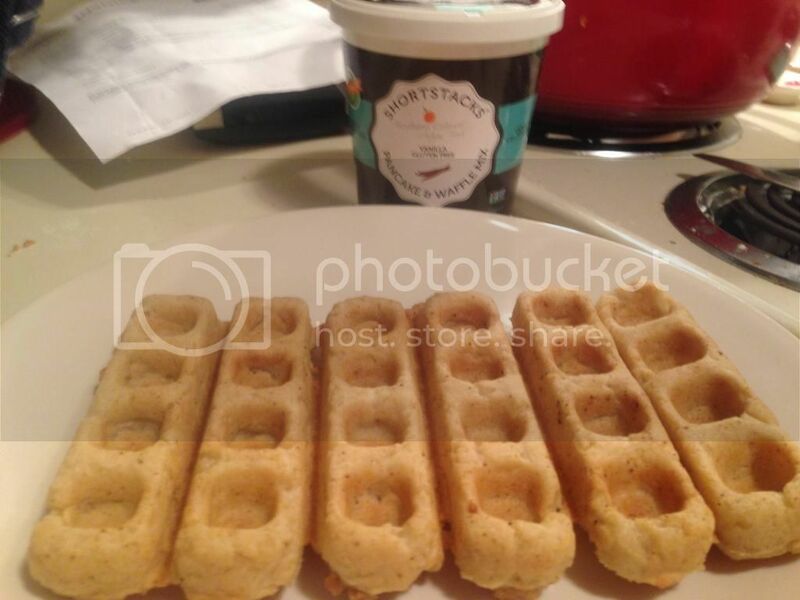 This entry was posted in Breakfast, Cuisine Cube, Entree, Food, Gluten-Free, Mix, Pancakes, Products, Review, Sweet Stuff, Vegan, Vegetarian, Waffles by The Celiathlete. Bookmark the permalink. Worst GF product ever! We tried it to and it was like a soggy hockey puck biscuit..Contacted the company and they refuse to refund me..
Could not agree more. Horrible.